In the pantheon of mythical creatures—right up there with unicorns, hippogriffs and manticores—we have in the realm of cruising a most important one: the perfect dinghy. This, of course, is a very subjective concept that exists in Platonic form in every sailor’s mind, but never in reality. That said, this is hardly perfection. For there are several things about roll-up inflatables I do not appreciate: A) they are not terribly durable, B) they are usually hard to row, and C) you can’t really sail them. The first point is the one I regret the most. One of my worst moments afloat came one afternoon when I accidentally harpooned my old Zodiac tender with a heavy length of angle iron. Loading the dink in a big hurry to get ashore on a very remote island, I had first chucked in the oars, then the deadly angle iron, which I routinely used in those days as a tool to help lever the corroded remains of my outboard’s lower end into the water. My chubby friend—already loaded with engine, fuel and sundries—sputtered, whistled and threatened to sink on the spot. I quickly grabbed some patches, a rag and the first tube of sticky stuff that came to hand and madly gunned for the beach. I staunched the wound with the rag and the heel of my foot en route and just barely made it ashore. The durability problem, I assume, is why rigid inflatables (RIBs) are so popular. I can see the attraction, but I’ve never been able to countenance their weight (an average 9ft RIB, I reckon, is about 20-30lb heavier than a roll-up) or the fact that they are bulky, even when deflated and are hard to stow. My eyes, therefore, widened a bit when I spotted the new folding F-RIB dinghies (foldablerib.com) on display at the show in Annapolis last fall. They struck me as well built and neatly engineered, with impressive specs and pricing. 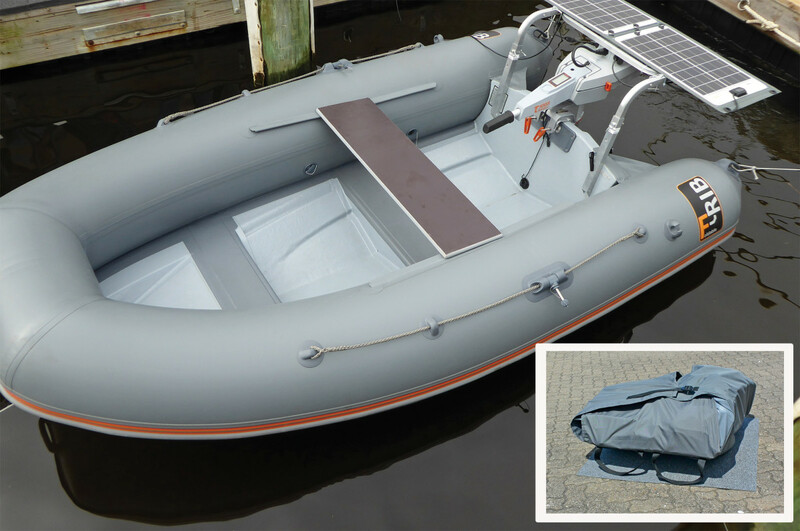 The smallest boat in the range is 9ft (my favorite size), weighs just 79lb and lists for $2,995, which is both a bit lighter and only a little bit more expensive than the plastic-floored roll-up soft inflatable I currently use as a tender. I championed the cause of the F-RIB during our annual Freeman K. Pittman Innovation Award deliberations here at SAIL, but my fellow judges were unrelentingly skeptical. They pointed out previous incarnations of folding RIBs—Steve Callahan’s idiosyncratic Clam and one eclectic, flat-bottomed West Marine offering—and decreed this was old hat. To me, though, it still looks like new hat. F-RIBs have proper deep-V hull bottoms, like regular RIBs, and fold into thirds rather than just in half, so they are nearly as compact as roll-up boats when broken down. What I find most interesting is the fabric used in the inflatable sponsons. This is Mirasol, a specially treated PVC fabric that, unlike most PVC material, is highly UV-resistant and, unlike Hypalon, the UV-resistant fabric of choice used in most quality inflatables, is quite light and doesn’t mind being repeatedly creased in the same place. As to my personal perfection criteria, I assume any RIB with a deep-V bottom should row more easily than a roll-up inflatable. I’ve never had a chance to try myself, however, and I can’t help noticing that most RIB owners would sooner swim than row anywhere. As to the issue of sailing, I see that the largest F-RIB in the line, a 16-footer, can be ordered with a sailing rig. This suggests that if only my notion of the perfect dinghy were much grander, I might be able to achieve it. But then I am sure it would then seem imperfect in some other way.